In the heart of Camden Market, just a short walk from Camden Town station, is our unique Camden Atrium location. This building combines style with sophistication. Colourful features, contemporary light fittings, and unrivalled views of Camden create a contemporary environment that stimulates creativity. Complete with private offices, meeting rooms, our very own LABS Pantry, and roof terraces that are perfect for after work drinks in the summer, it’s a workplace that not only attracts talent, but impresses guests, too. Atrium is more than just a space. We’ve worked hard to develop a community offering which helps build networks, make connections, and offer educational opportunities. 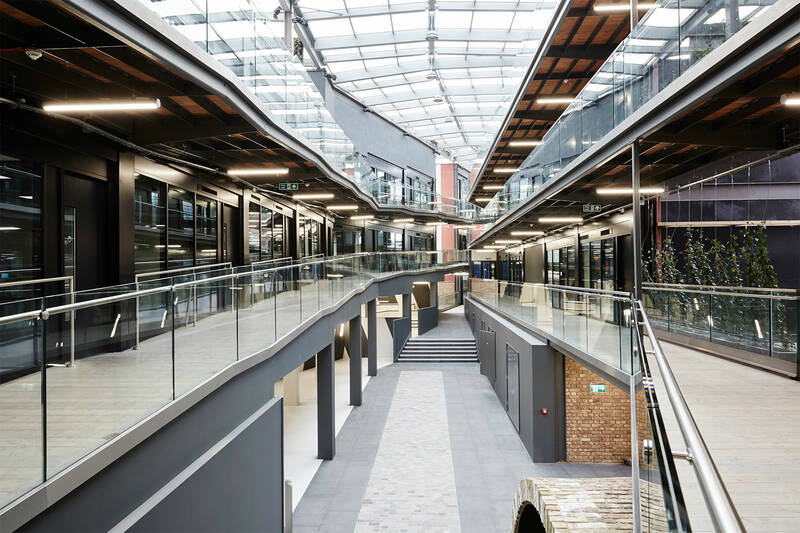 A regular events calendar which is tailored to our members, collaborations with partners such as TEDxCamden, and fresh chef-made food and artisan coffee in the LABS Pantry are just a few of examples of life at the Camden Atrium. Alongside our state-of-the-art technology, our dedicated LABS App, expert advisors, and investors on board, Camden Atrium is the perfect place to grow your business and your team. You’re right in the heart of Camden, surrounded by a variety of stalls, the famous KERB street food market, Regent’s Canal, and eclectic high street shops. There’s plenty of idyllic places to spend your lunch breaks. Just a short walk from Camden Town station, a large number of bus stops, and Chalk Farm station, you have great transport links enabling you to travel into central London in less than ten minutes. We’re creating a dynamic Camden campus, with three current sites and more to be opened in the coming months. This makes you part of an interconnected community of like-minded professionals, gives you access to a larger events calendar to choose from, and means you have more locations to visit should you wish to have a change of scenery. Want to secure your space at Camden Atrium? Drop us a line today. As one of the first tenants in Atrium we have watched the community grow to become a buzzing space which ripples throughout the building. As creators of engaged communities based around location, London Belongs to Me Ltd loves being based at Atrium – the experience here closely mirrors what we do with our websites and magazine titles.